The fun part about Club 122 is that you are always trying to maintain your membership. Franchises in the Big 4 leagues move on occasion, while those that stay put open new venues on a regular basis, so there are always cities to revisit. This season sees the 49ers playing out of Levi’s Stadium in Santa Clara, so every member of the club is heading to the Bay Area at some point this year. 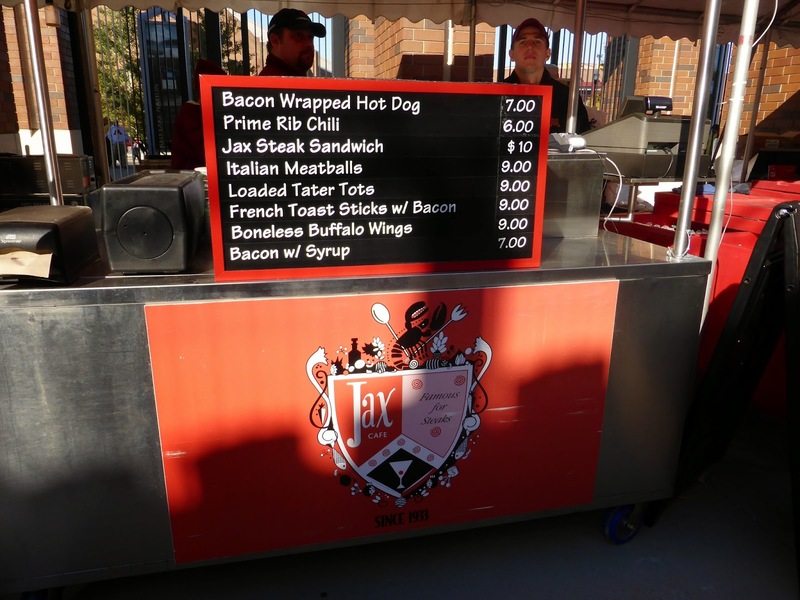 Meanwhile, the Vikings are using temporary digs at TCF Bank Stadium, which for some doesn't qualify as a necessary stop. It does for me though, and so I spent the weekend in Minneapolis, my fourth time there in the last five years. With the Golden Gophers playing on Saturday, it made for a great weekend. Until the Vikings took the field. 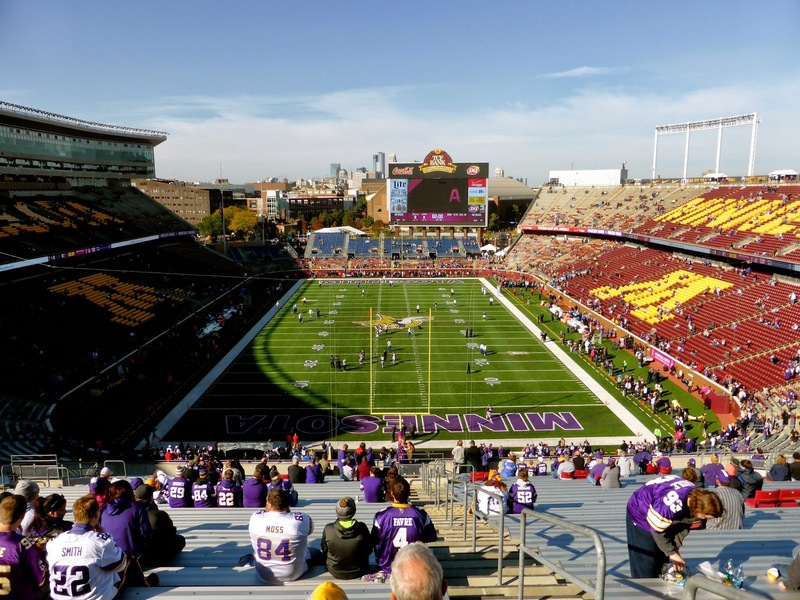 I wrote about TCF Bank Stadium in yesterday’s post, but there are a few differences when the Vikings are the home team. 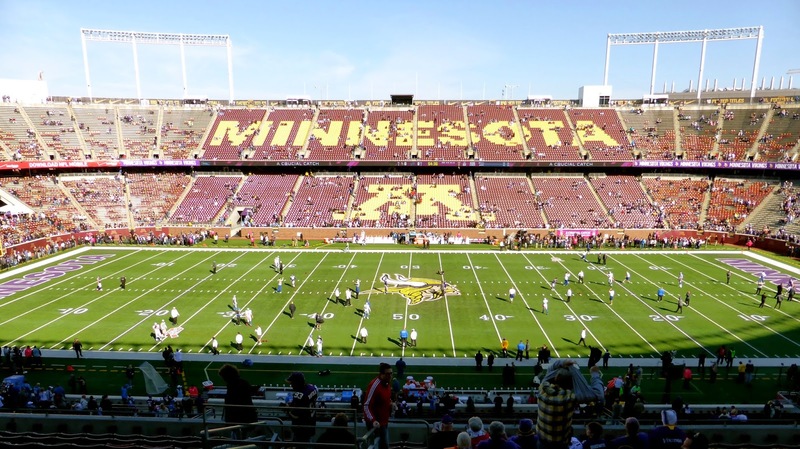 The ribbon boards are covered with Vikings signs or NFL sponsors (you might be able to see that above), and the field is also repainted with Minnesota in gold and purple instead of maroon and gold. 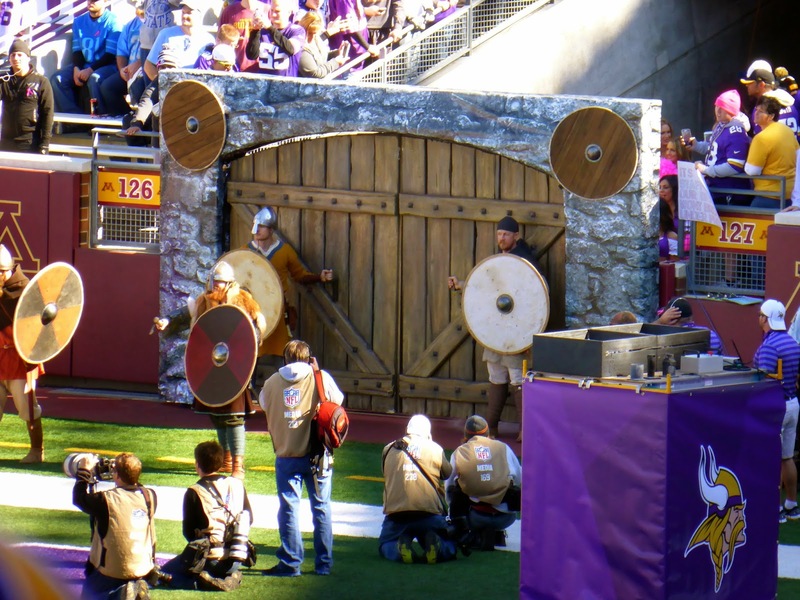 The Vikings also appear through a gate meant to evoke a Viking attack (below). Sadly, this image did not take root in the minds of the team. The most surprising difference though was in the food prices. 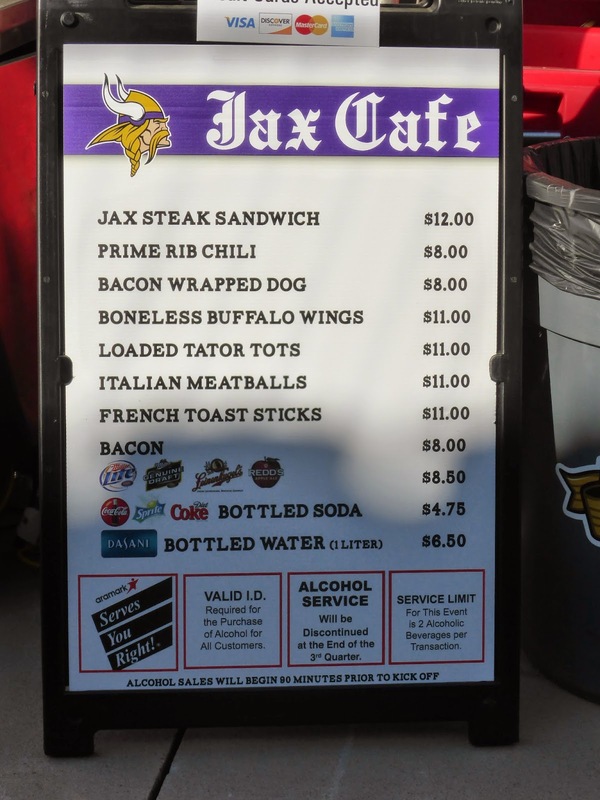 Nearly everything was a little more expensive for the NFL game. The bread bowl stew went from $5.50 to $6 as an example. Check out the two menus below – an extra $2 for chili renders it overpriced and no longer an option. Other than those superficial changes, the stadium was identical, with no special Vikings displays. As the team is only here for two seasons, there is really no need to personalize it beyond what has been done. Again, if you want to see TCF Bank Stadium, go for the college game and wait for the Vikings to open their new stadium in 2016. 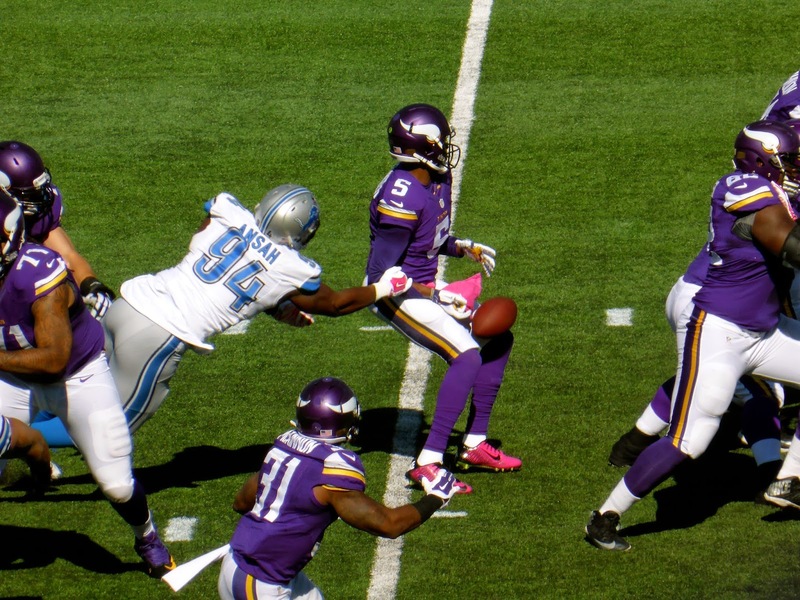 With Calvin Johnson and Reggie Bush both injured, points promised to be scarce. The Vikings have a terrible rushing offense without Adrian Peterson, and Detroit has the best defense in the league. The game would be decided by Teddy Bridgewater, making his second career start. Could he pass the Vikings to victory? Ummmmm, no. 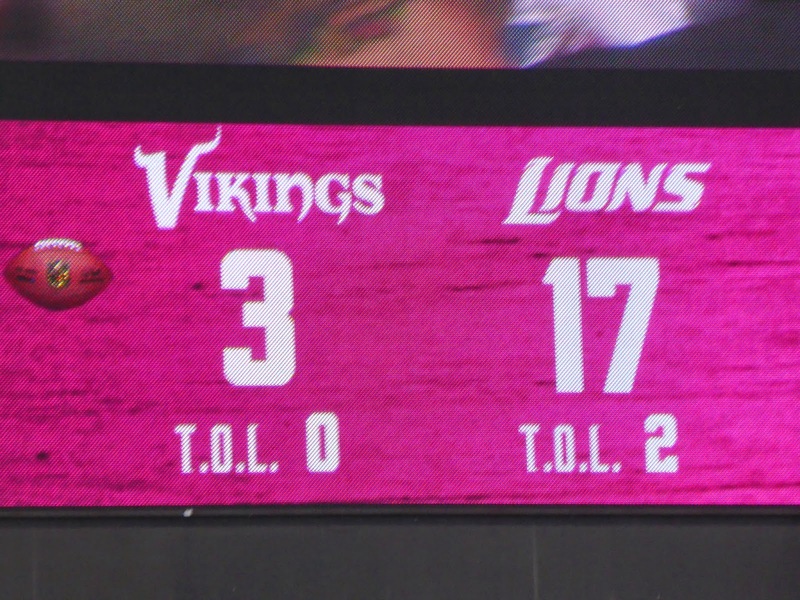 I told my buddy Eddie (who has now seen games in all 32 current NFL venues) that this would be a very low-scoring game and was promptly made to look foolish at Matthew Stafford drove the Lions 80 yards on just 7 plays, hitting Theo Riddick for the touchdown just four minutes in. That was the highlight of the game. After that, it was punt after punt after punt (14 in all). On a couple of occasions, Detroit attempted field goals. 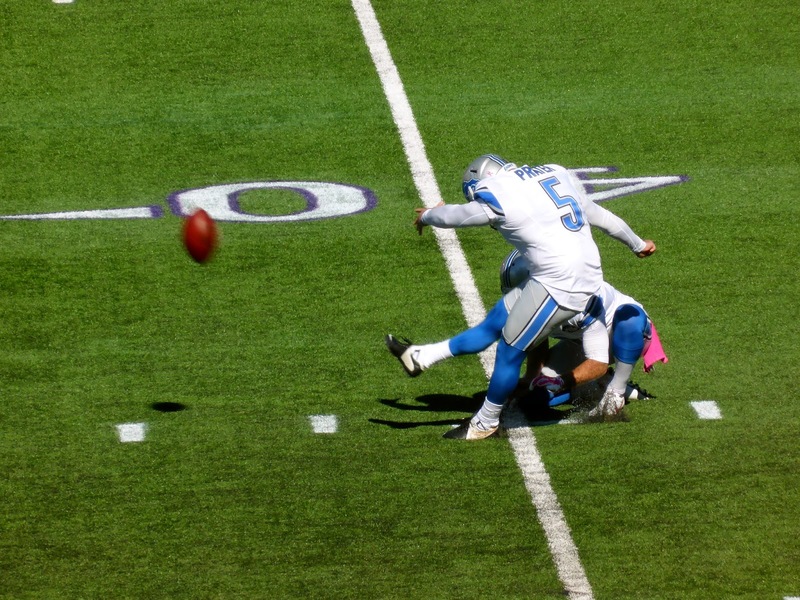 Matt Prater, recently signed after being cut by Denver, missed his first field goal from 50 yards out (above), although he hit his second just before halftime from 52, giving the Lions a 10-0 lead at the break. The Lions added another touchdown early in the 3rd quarter on a 1-yard run from Joique Bell to make it 17-0, while Prater hit the upright with his third attempt on their next possession. The Lions are 5-15 on field goals so far this season, but it is expected that Prater will stabilize the situation; there were swirling winds throughout the game that made kicking a bit more difficult than it would normally be. Bridgewater meanwhile failed to impress. His line of 23-37 for 188 yards is nothing special, but being sacked eight times and throwing three interceptions and fumbling the ball (above) make it a very bad day indeed. The Vikings avoided the shutout with a late field goal. The NFL gets a lot of bad press from its stupid and drunk fan base (one stole a prosthetic leg in Philadelphia this past weekend), but fans here are among the best in the league. The team placed an ad in the free program stating “We are Vikings not Barbarians” and everybody followed along. Sure, there were a couple of drunks here and there, but Minnesotans lack the chip on their shoulder that so many other fans seem to possess, enjoying the game despite it being really an ugly affair for the home team. I've seen three NFL games here and never had a problem nor seen one. Looking forward to my next visit when the Vikings open the new stadium in two years. Both visiting teams scored 17 points on the weekend. The Vikings just needed 3 touchdowns to match the Gophers score. So close and yet so far.